Amanda, 6, poses in her Brooklyn, N.Y., apartment. Amanda's mother, Rossana de la Cuadra, has had mold in the bathroom of the apartment on and off for most of the 14 years that she's lived there. She believes the mold may be a contributing factor Amanda's asthma. Rossana de la Cuadra and Jose Santos are fighting their landlord to provide an asthma-safe environment for their sick daughter. Javier Sepulveda watches the cockroaches skitter across the floor of his Harlem apartment with a mixture of anger and angst. For him they are more than just a nauseating nuisance: They’re one of the main reasons his 12-year-old daughter, Melissa, sometimes struggles to breathe with the scary sensation that she’s suffocating. Like many others living in low-income neighborhoods, Sepulveda has discovered that his home is implicated in his daughter’s asthma—and that there’s little he can do about it, a Dateline investigation, part of the year-long NBC News "In Plain Sight" poverty reporting initiative, found. Not long ago scientists noticed a link between poverty and asthma. Now they’re starting to discover that where you live plays a big role in explaining the connection. From dilapidated and deteriorating housing to smog-choked outside air, impoverished inner-city neighborhoods are a breathing hazard for both young and old. Studies have shown that roaches and mice produce powerful allergens that can kick off allergies and asthma. And while those pests can crop up in more affluent urban neighborhoods, they are a virtual epidemic in communities inhabited by the poor. 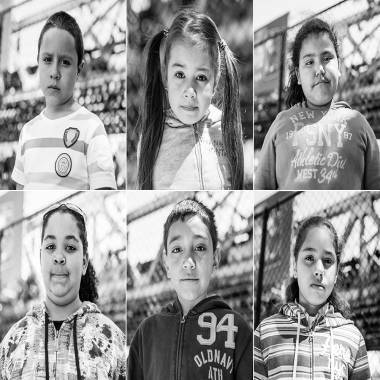 Six-year old Amanda, who lives in Brownsville, New York and 12-year old Melissa, who lives in East Harlem, New York are struggling with the disease. Their parents, who are desperately trying to alleviate their suffering, and are about to make a devastating discovery. A Dateline analysis of a 2011 U.S. Census Bureau report found that public housing apartments like Sepulveda’s had almost four times as many roach infestations and three times as many leaks as private rental apartments. Leaks, it turns out, can create mold, another allergen that can spark and exacerbate asthma. 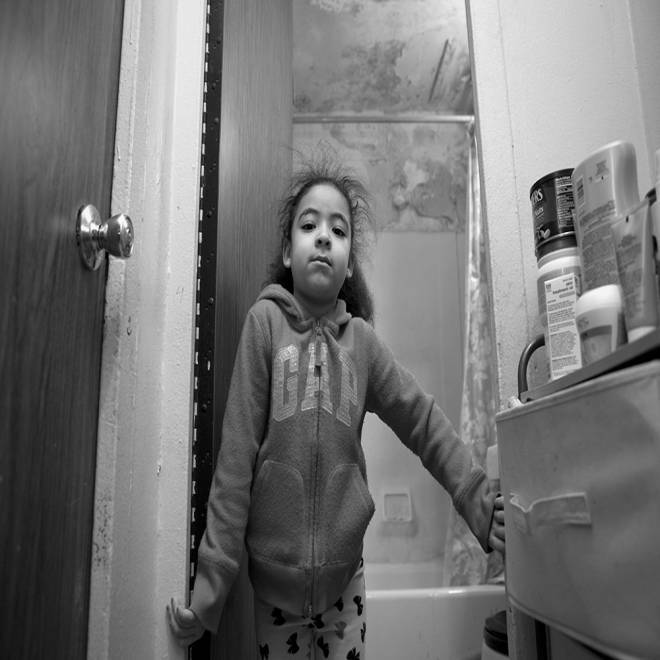 Though mold covers the ceiling and walls of Sepulveda’s bathroom—and most likely has exacerbated Melissa’s asthma—his landlord, the New York City Housing Authority, has been slow to make the necessary repairs that would get rid of it, according to Dateline investigators. New York may be the perfect place to see the impact of income on asthma. In the space of just a few blocks there’s an enormous income gap—and a corresponding three-fold jump in the asthma rates. In the affluent Upper East Side, the rate among 4-to-5 year-old children is 7 percent. By contrast, in impoverished east Harlem — the neighborhood right next to it — the rate is 19 percent. The asthma-poverty connection isn’t limited to New York, though. In Philadelphia, researchers have found asthma to be stunningly common in some of the poorer neighborhoods. 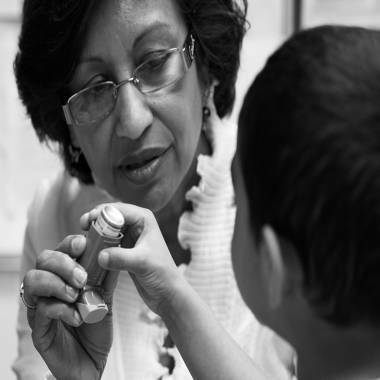 In door-to-door surveys that included 5,563 children, researchers found that 21.7 percent of kids had been diagnosed with asthma. Even more telling was the breakdown by zip code. The two communities with the highest numbers of children living below the poverty line had asthma rates of 40 percent and 47 percent, according to a 2012 study by researchers led by Dr. Tyra Byrant- Stephens, a professor at the University of Pennsylvania School of Medicine and director and founder of the community asthma prevention program at the Children’s Hospital of Philadelphia. In St. Louis, the poorer neighborhoods have upwards of 30 percent to 40 percent asthma rates, said Dr. William Kincaid, chair of the St. Louis Regional Asthma Consortium and an assistant professor of health management and policy at the St. Louis University College for Public Health and Social Justice. In East Baltimore, one of the poorest areas of the city, at least 95 percent of homes are infected with mouse allergen, said Dr. Elizabeth Matsui, an associate professor of pediatrics and epidemiology at the Johns Hopkins Medical Institutions. Matsui and others have found that exposure to mouse dander is even worse than exposure to cockroaches when it comes to asthma. And it’s not just indoor allergens that are a problem. Poor neighborhoods are often the ones chosen for highways and other projects that more affluent communities manage to fend off. In New York, poor neighborhoods tend to be crisscrossed by major roads clogged with diesel-powered vehicles that spew particles into the air that can trigger or exacerbate asthma, said Matt Perzanowski, an associate professor of environmental health sciences at Columbia University’s Mailman School of Public Health. Legislation to provide health insurance for poor kids has helped those with asthma, but it has not been a panacea. Dateline NBC spoke to families with young children affected by asthma at a Family Fun day hosted by Urban Health Plan, in the South Bronx, last May. Collectively, these kids missed doznes of days of school last year because of asthma-related health problems. L-R top row: Neven Rosario, 7; Ariel Kramer, 7. L-R bottom row: Amanda Diaz, 11; Edwin Benitez, 9; Irene Kramer, 12. Many low-income neighborhoods don’t have enough physicians, Bryant-Stephens said. Making matters worse, poor parents often can’t get time off from their jobs to take children to the doctor. That’s something 33-year-old Tiana Gaines-Turner, a working mom from Philadelphia, understands all too well. Because she and her husband both have low-paying jobs, they are often strapped for cash. That means they sometimes have to borrow money to take their kids to the doctor. All of which can lead to poorly managed asthma, and children being rushed to the emergency room. Studies have shown that poor children are up to 15 times more likely to be hospitalized for asthma than their wealthier counterparts. While the visits may fix the acute problem, they’re not providing a long-term solution. But even when the medical care is optimal, there’s still the home environment to worry about. That’s been the struggle for Amanda Santos’s mom, Rossana de la Cuadra. Kelvin Torres visits Dr. Acklema Mohammad for a check-up and spends time on the playground with his father who is also severely asthmatic. By morning Amanda was worse. Scared for her daughter, de la Cuadra took her to the doctor. Though the doctor provided care for Amanda’s asthma, her condition continued to worsen—as did the mold on the family’s bathroom ceiling and walls. Like with Sepulveda's apartment, NYCHA was so slow in making repairs that Amanda’s family decided to fight them in order to make the apartment safe for their daughter. After battling the NYCHA for two years, sometimes very publicly, de la Cuadra finally got the housing authority to fix her bathroom and obliterate the mold. “They took the cabinets down. They took everything down, even the bathtub,” de la Cuadra told Dateline. It didn’t take long for the repairs to be felt by Amanda, now 7. While Amanda’s day-to-day existence seems to have improved dramatically, she’s not really all better.